Is DNA an algorithm? Can its renderings be presented as Algorithmic Art? Will they jump down off the wall and attack the well-dressed gallery patrons? As always, click on any image to view it on the original web site or in full-size. It’s easy to define (and limit) fractal art to the renderings of fractal formulas, but then that also focuses our attention and our consideration on just that kind of imagery. That makes a lot of sense at first because really, aren’t insects and weird microscopic creatures a completely different sort of visual thing than computer rendered fractal formulas? On the other hand, we raise no objection to the inclusion of the complex creations of layering and other graphical manipulations when they’re labeled as fractal art even when their (assumed) fractal formula qualities are hard to recognize. (Well, they at least started out as fractals.) Perhaps the boundaries of any genre start to look arbitrary and fuzzy when we try to defend them. Maybe visual imagery is more about what it looks like than how it was made? In that case: what does “fractal” mean? 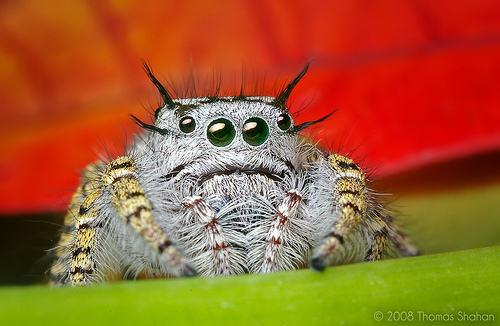 After attending every live concert ever given, this Grateful Dead fan was spontaneously transformed into a hairy spider and now waits patiently on a tree leaf for the End of the World. Yes, arias combined the products of several formulas to create this very natural and stylish image. This is a masterpiece of layering, and not the usual monstrosity that often results. Check out the high resolution version (6000 x 2326 pixels) and you can marvel at the rich detail in this well composed image. Note especially the mandelbox details near the middle edge on the right. Arias is Bernard Bittler, has a professional art background and I believe lives in France. I’m sure he’ll be making many more 3D fractal images because he’s obviously very good at it. This one is also even more impressive viewed full-size. I like the subtle, blue-gray coloring and of course the velvety texture of the “clock faces” or “drums” that are silent and yet ever-watching this tiny mandelbox neighborhood. I might have titled this one “fungus clocks”. It looks very natural and is proliferating with the growth of these round clock faces that to me resemble the smooth velvety surfaces of some tree funguses. The fine detail to the left and right of the main Cube Guardian is a great presentation of the endless recursion of fractals. It’s hard to put my finger on exactly what I find so captivating about this image. There’s some surreal mood to this image and the title, Fractal Forest, is a good one as it really has the look of a strange, but forested, place. 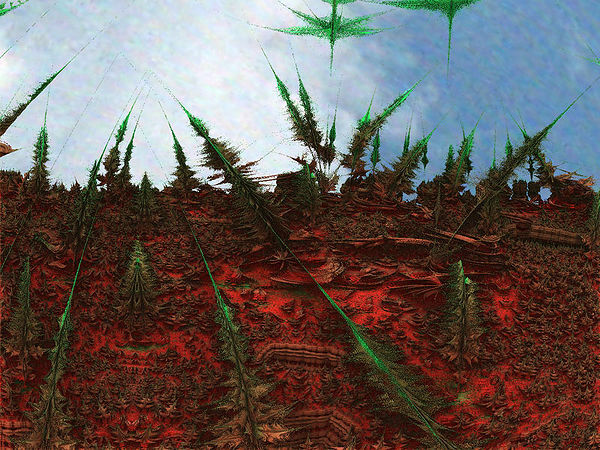 The red-green coloring is very creative and works well despite being so unusual and unnatural for such a suggested “forest” scene. You’d never guess this was a mandelbox (and I’m guessing) but it just shows how powerfully creative fractal art can be when you’re ready for the unexpected. There’s a old, oil painting, Renaissance feeling lurking around down there. 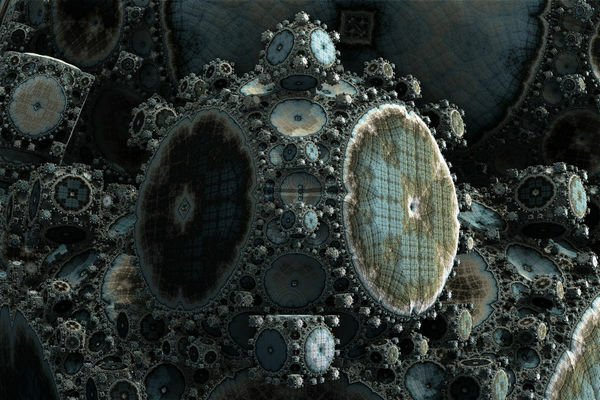 This image I found in a thread on Fractalforums.com discussing the “Hausdorff dimension of the Mandelbulb”. I have to confess that although Fractalforums is an extremely rich environment for the discussion of all sorts of concepts and technical matters related to fractals and their rendering, all I mostly do is look at the pictures. 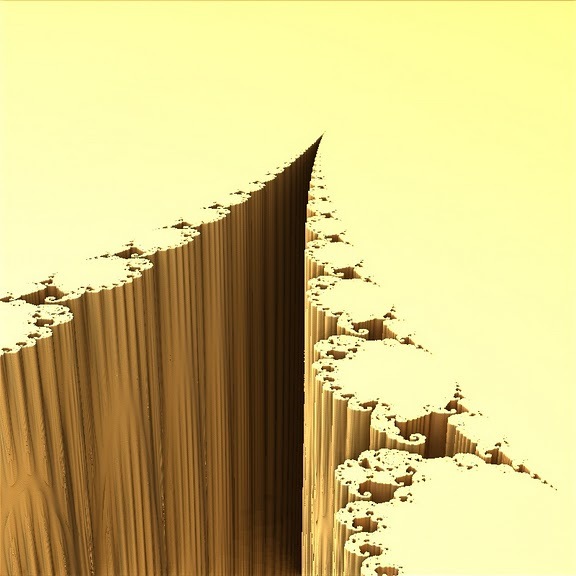 Perhaps this image was not intended by Prokofiev (a screen name, I assume) to be a powerful work of fractal art but rather merely to function as an illustration of some concept or technical issue? Well, in that case it succeeds at both. I’d like to title it, “Unzipping Infinity”. Art doesn’t have to be lavish and complicated, it just has to push a few buttons in your mind. 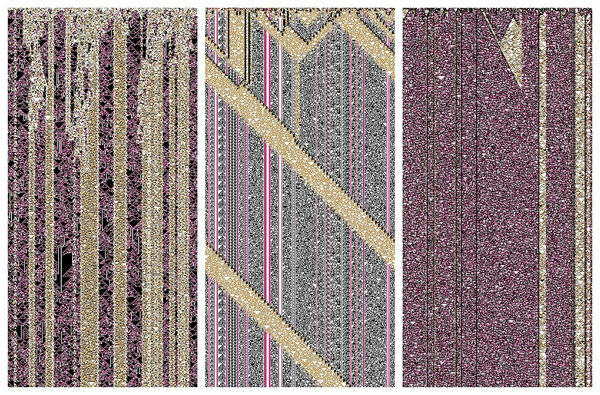 A cellular automata triptych (three panel) made in Ultra Fractal. Although cellular automata aren’t anything overly complicated to render, I didn’t know UF could render CA images. I like the triptych style; it suggests something carefully made and designed to be set over top of an altar —sacred renderings. Click on the image to see the cosmic details as well as things that cannot be explained. CA have some interesting fractal and not so fractal qualities to them. For one, there’s always a large scale structure to the image as well as a myriad of small, tiny scale structures. This gives CA both a macro as well as micro appeal. CA are the busy ants of the fractal (or something) world and this set by Far is a reminder that the creative possibilities are far from over for them (no pun intended). Time for a movie. Here’s an excellent fly over of a special area of a mandelbox that Kraftwerk (aka Mandelwerk on DA, aka Johan Ason) has been exploring recently. This fly over is particularly well done and much more engaging than most I see because there is a specific subject or point of interest in it, that being the “Cheops” collection of structures which are also particularly interesting as still images in their own right. Much more of “Cheops-ville” can be seen at Mandelwerk’s Deviant Art site (aka Kraftwerk). Your initial question asking “is DNA an algorithm”, got me thinking about a recent topic started within FractalForums, entitled “Genetic Programming to find the 3D brot”. I know there are several individuals that believe fractals may be found in all areas of science and existence. But then again, I have also seen many arguments concerning the true definition of what constitutes a “fractal”. So many of these conversations (and arguments) end up becoming less mathematical and scientific, and turn to the philosophic. Deciding “what does ‘fractal’ mean, may be one of those issues there never truly ever gets answered (if we disregard what Benoît B. Mandelbrot meant when he coined the term to describe such structures). 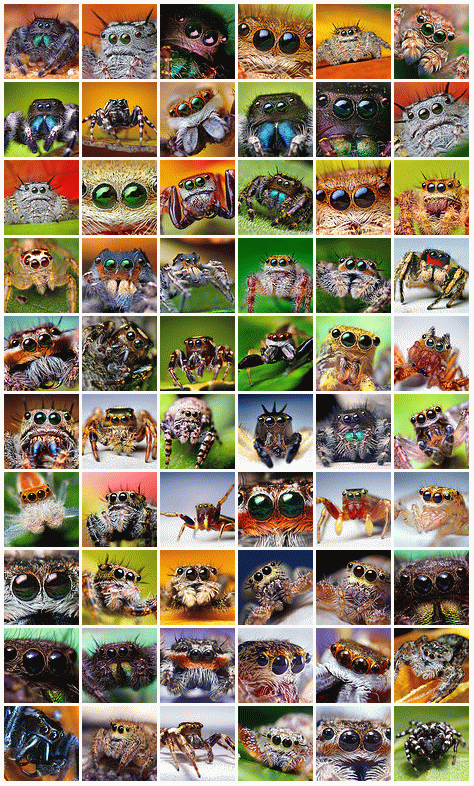 BTW, enjoyed the inclusion of the “Jumping Spiders of Oklahoma”, they were very fractal like in appearance. Thanks for the mention of my Cheops series, very glad you appreciate it!